Rising from the ashes of a scene that was once pronounced dead, David Shaw & The Round Trip brings in-your-face hard rock back with a vengeance. Formed in the fall of 2006, the band has become one of New York’s top live music attractions. David Shaw is a NYC rock veteran who made his mark with popular acts such as Shotgun Annie, Soul Crunch and Down with the Blonde. 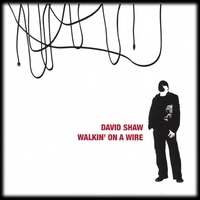 After several years of living in Los Angeles, Shaw recorded a solo CD, Walkin’ on a Wire, and returned to New York to assemble the band that would come to be known as The Round Trip. The name is apropos as Shaw’s travels and musical journey both brought him back to his hard rock roots. Shaw quickly recruited guitarists Rob Mayer and George Giannoulis, friends and bandmates from NYC’s rock and roll heyday, and soon found a young drummer named Derek Davis through an online classified ad service. Together, the band has enjoyed considerable success which is due in large part to the members’ talents, energy, experience and vast array of influences. The band set out to tour in support of Shaw’s disc. Walkin’ on a Wire received nothing but great reviews worldwide and features the best of what hard rock is supposed to be about. Recorded at In My World Studios in Mesa, Arizona and featuring the guitar and production talents of Steve Cone, another ex-bandmate of Shaw’s, the collection rocks with reckless abandon. Crunchy guitar riffs, smooth-yet-aggressive vocals, memorable hooks, thundering rhythms and blazing solos combine to create a rock and roll experience like no other. On stage, David Shaw & The Round Trip have become a virtual three-ring circus. The band’s boundless energy grabs hold of new fans with every show and the musicianship wins over even the most cynical onlookers. •	Invited to perform at the enormous first annual Rocklahoma Festival after finishing in the top three in national fan voting. •	Music featured on MTV original programming. •	Successfully toured the east coast as a headliner. •	Performed to packed houses in Los Angeles culminating in a wildly successful one night stand at the famous Whisky A-GoGo in Hollywood. •	Shared bills with platinum-selling national hard rock bands such as Great White, White Lion, Bang Tango, Enuff Z’Nuff, House of Lords and Britny Fox. •	Contributed tracks for Beautiful Escape, a tribute album to seminal power-pop band The Posies. David Shaw & The Round Trip can be counted on for intense, fun and enthusiastic performances. Get your copy of Walkin’ on a Wire today and don’t miss your next opportunity to see the band rock a stage near you! Great disc for fans of straight ahead rock and roll. I'm not just saying that because I played on it. It does rock and made me play a different style than what I normally play. My favorite tracks are Within The Gray, I Don't Mind, Tinkerbell and Welcome home. Get it today and support independent musicians like David and myself. David, your album was KUWL. I also have your CD Horizon Lenses. I liked your cover of The Knacks', That's What The Little Girls Do. Keep up the great work.